“The whole stadium is filled with the spirit of God—you can feel God in this place.” As the Rev. 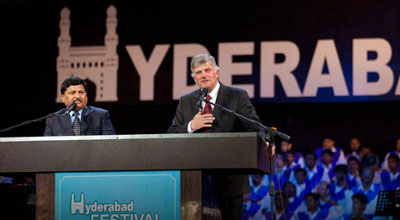 Mohan Babu welcomed the crowd to the first night of the Hyderabad Festival with Franklin Graham, the pastor’s words proved to be prophetic. The Holy Spirit stirred the hearts of 1,240 who responded to the Gospel message at the end of the evening. India is on fire right now. In the last couple of years our church (VCC Laguna Niguel) has sponsored at least 3 conferences in India with incredible results. During one campaign more than 50,000 attended the services with nearly 20,000 coming to Christ plus 100’s of healings. Several of my friends were on the ministry team and came back reporting that everyone they prayed for was healed including some who were blind. I sure would like to see that happen here in America. Last Fall the world was horrified by the riots and persecution against Christians in the state of Orissa, India. Hundreds of churches and Christian businesses were destroyed, over 200 were killed, and 50,000 Christians were kicked out of their homes and villages with 30,000 going into the forests for hiding. The problem still has not completely been resolved with the Indian Federal government dragging its heals and with the state and local authorities on the side of and actually in many cases participating in the persecution. One good did come out of the persecution–the India Supreme Court ruled that there is “freedom of Religion” in India and all are equal under the law. What led to the persecution? An incredible revival that saw approximately 28% of the population of Orissa converting to Christianity in a few short years. The Orissa persecution was a blowback for the major changes taking place and for the potential shift of political and economic power in the state. The Hindu radical party is heavily invested in stopping the revival at all costs. What are the major characteristics of this revival? Very similar to the on-going revival in China.